Lord Kerslake, the former chief executive of Sheffield City Council and Cllr. Julie Dore, the council's current leader, have thrown their full weight behind the campaign to bring the HS2 route into the centre of Sheffield. Transport Secretary, Patrick McLoughlin confirmed that high-speed rail was a priority in a recent speech in Leeds. He said that the The full "Y" network of HS2 will be built - From London to Birmingham and Birmingham to Manchester and Leeds. Construction is set to start in just two years. In his maiden speech to the House of Lords, Bob Kerslake discussed the Queen's Speech and the city devolution bill that could lead to more powers for the Sheffield city region. He said: "It is in everyone's interests that discussions to build on the deal agreed at end of the previous Parliament begin soon. One important issue that should be revisited as part of these discussions is the location of the HS2 station in Sheffield. The impact on growth, jobs and business rates if this is located in the centre of Sheffield is significantly higher than the alternative of an out-of-town parkway station. It also keeps open the future opportunity to create a genuine economic powerhouse through improved connectivity with Leeds and Manchester." Cllr. Julie Dore, leader of Sheffield City Council, added: "Locating the HS2 station in Sheffield city centre is absolutely crucial in helping the North to reach its full economic potential. We need a fast, connected transport network, where HS2 and HS3 are seamlessly linked, to enable people to move between Sheffield, Leeds, Manchester and London quickly and easily. "A HS2 station in Sheffield city centre is the only way that this can happen. A HS2 station out of town, in a distant Parkway location some six miles from a HS3 station in Sheffield city centre, simply doesn’t make sense – geographically or economically. "It is now clearer than ever that the UK needs our great Northern cities like Leeds, Manchester and Sheffield far better connected so that we can really punch our weight globally. "Transport investment – between cities and to London, is a critical ingredient of that vision. HS2 must now be delivered in a way that helps to best realise the vision of a connected, northern economy, not as a standalone transport project. 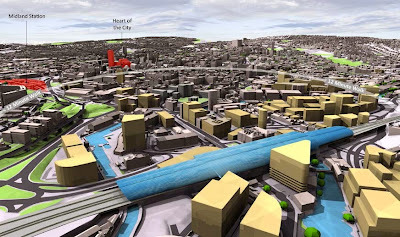 "The evidence for a HS2 station in Sheffield city centre is overwhelming. It cannot be ignored." Having recieved more evidence, the Government is set to make its Phase Two announcements this autumn, confirming the location of the South Yorkshire station. Andrew Denniff, chief executive of Barnsley & Rotherham Chamber of Commerce, said: "The HS2 situation around the location of the South Yorkshire station needs to be resolved quickly and in the best interests of the city region. "This Chamber of Commerce continues to articulate firmly in all these discussions our long held view that the current proposals to locate the station at Meadowhall remains the best option. "The central thread of the whole debate is the argument around supporting the wider region and the associated economic benefit to the whole Sheffield city region." But why is it always Sheffield Centre that gets everything. They should stop all this 'Sheffield City Region' stuff which is just a way for Sheffield to take credit for everything in SY. This is getting daft. The S. Yorks. HS2 station is supposed to benefit the whole City Region. At a guess Sheffield has say 25% of the total population of the whole City Region - so who are Sheffield City Council to dictate to the other 75% of the City Region (who want the adjacent to M1 location). People with long memories will remember that, after an apparently strange process, we in S. Yorks. ended up with a too small airport in the wrong place. Guess where it was - in Sheffield. Had it been built in the right place - on the edge of Rotherham - we would still have it and not be the only significant city region without an airport! After hearing the news last night and reading this this morning, what a waste of public money Sheffield Council, sham on you, the road network into Sheffield is appalling, the money wasted on trying to site HS2 in Sheffield City centre would have been better spent on improving the road system, then everyone in the 'Sheffield City Region', which I am lead to believe is Rotherham, Barnsley, Sheffield and Doncaster not 'Sheffield City Centre' may have come around to a Sheffield City HS2 site. The HS2 is to benefit ALL in the 'North' and a site at Meadowhall would be a greater to advantage to many more people than just Sheffield. it's a no brainer for me - it has to be in sheffield city centre to ensure the economic benefits are realised. Re earlier comment on airport err.... it was located on the edge of rotherham !? To be honest the best location is Meadowhall.Sheffield city centre lol it's bad enough now getting into town centre now never mind if they start building Hs2 rail track it will definitely effect all the businesses even closure.Wake up Sheffield city council!!!!! In terms of existing infrastructure and access the current site at Meadowhall must be regarded as best. For most people they will get on and off a train via a road vehicle and to do this with minimum disruption the station needs to be in the most accessible location. This will minimise travel time which is the primary focus for most people using HS2. There is plenty of alternative scope for further investment into the ever improving City Centre. I think the City has already transformed from 15 years ago.